This is the Intrinsically Safe version of the Sensear smartPlug R.
Get the non-IS smartPlug R here. Sensear's smartPlug R IS is an intrinsically safe in-ear hearing protection solution that allows for both face-to-face and two-way radio communications in high-noise environments. Powered by your two-way radio, the smartPlugR requires no battery to provide clear 360° hearing, facilitating face-to-face conversation even in the loudest environments. That means the wearer can easily stay in touch with other workers while also remaining aware of warning sounds or other important auditory cues. As with the rest of Sensear's top-of-the-line high-noise communications equipment, the smartPlug R IS features patented SENS® technology paired with a noise-suppression microphone to provide crystal clear communications in the most challenging work environments. Meanwhile, an electronic volume limiter (limit: 82dB) ensures that the sound produced by the smartPlug R IS earpieces remains at a safe level. Sensear is simply the best hearing protection gear for facilitating high-noise communications available anywhere today, at any price point. 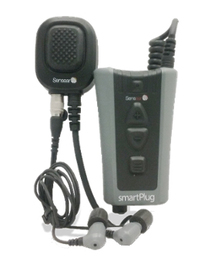 The smartPlug R IS offers a larger and more ergonomic PTT module, as well as a new detachable ear piece assembly. Foam tips provide NRR 31 (SNR 38) protection from sound. Silicone tips provide NRR 24 (SNR 32) protection. Watch the video to learn what sets Sensear apart from the rest! 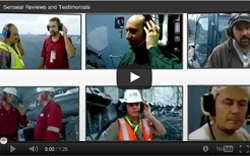 See Sensear in action all over the world, and learn what sets Sensear apart from other hearing protection & communication solutions for high noise environments.